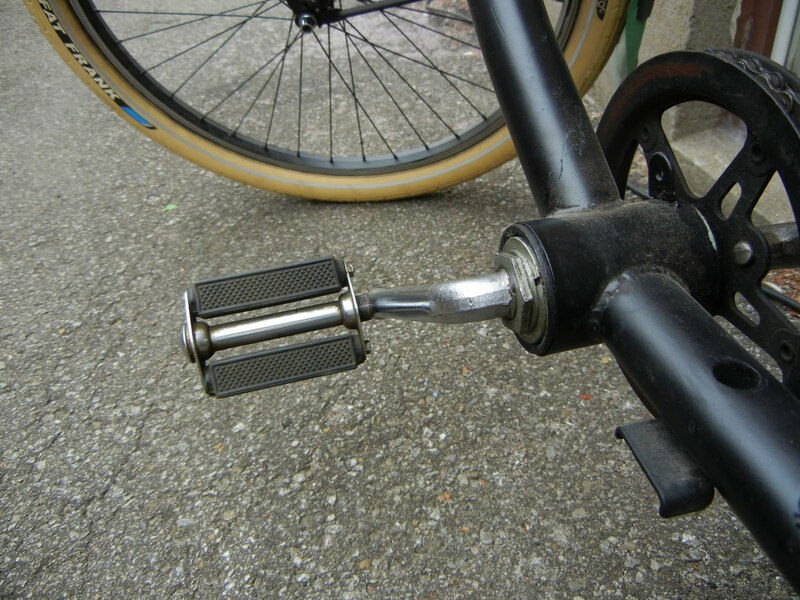 Free advice on how to fix your bicycle: Spring bicycle maintenance, getting back in the game. Spring bicycle maintenance, getting back in the game. Well finally Spring decided to show its face around here and I managed to find some time to get my bike out of storage. Proper planning in the Fall of storing parts in designated places made getting them back on the bike a breeze. Nothing is more frustrating than losing an hour swearing like a sailor because you can't locate your seat. That's valuable riding time lost and your loved ones thinking less of you. The one thing I caught myself doing however was having a hard time screwing the first pedal back in. I very well know that the left side pedal is a reverse thread, so I should be the first to catch on to any kind of problem. So there I am on the right side and the darn thing won't screw in. While scratching my head trying to figure out if the entire Universe had a pole shift for this not to work, I turned the pedal over and realized that it was the left side pedal! This goes to show that, like the drivetrain on your bike, your skills can sometimes get a little rusty. Remember this if you start to wrench on your ride after you've been on hiatus. Deal with one problem at a time, double check everything you've touched and don't postpone anything for later, even for a minute. Another important aspect is to do a short test ride after doing any kind of repair on your bike. Go as far as you are willing to walk and bring some tools. Going for a big ride right after a big repair is asking for trouble. I hope this little advice has helped you out. Riding a bicycle is does not a difficult activity and we be able to do it in anywhere. consistent with me riding a bicycle is a good hobby because, it does not fool gone many time and it's a kind of a good activity. I forever do this pastime on Saturday and Sunday. In does not free time I forever study very hardly to the examination or preparing for myself to rapidly examination? I forever ride a bicycle for 1 hour. If I have an occasion I also learn. My activity is all concerning study. But my pastime is riding a bicycle. Go for this best essay writing service to having an excellent associate in composing and still you can get the rules as well.